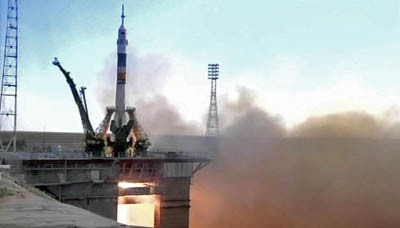 Under a clear blue sky, the Soyuz TMA-05M spacecraft blasted off from the Baikonur Cosmodrome in Kazakhstan at 10:40:03 p.m. EDT Saturday (GMT-4; 8:40 a.m. local time) and quickly climbed away atop a rush of fiery exhaust. Standing by to welcome them aboard will be Expedition 32 commander Gennady Padalka, cosmonaut Sergei Revin and NASA astronaut Joseph Acaba, who were launched to the lab on May 15. They've had the station to themselves since July 1 when Expecdition 31 commander Oleg Kononenko, European Space Agency astronaut Andre Kuipers and NASA astronaut Donald Pettit returned to Earth.